This page includes a state version of several of the regional analyses conducted by the Midwestern Regional Climate Center (MRCC) and image products from several satellite sensors. Note that the following has not been updated since 7/29/2015. Current information on U.S. soil moisture can be found at the NLDAS Drought Monitor Soil Moisture site. It is to be used for research or educational purposes only; it is not considered operational. Soil moisture estimates based on yesterday’s data are updated in the late morning and estimates based on today’s data are updated in the late afternoon. The soil moisture amounts for three levels (0-4", 0-20", and 0-72") are calculated using a multi-level soil model responding to daily temperature and precipitation in the counties of the region. The model is designed for the growing season when temperatures are above freezing, and does not take snow depth into account during the winter. Daily estimates of precipitation are obtained from The National Weather Service Multi-sensor Precipitation Estimate product (http://www.srh.noaa.gov/rfcshare/precip_analysis_new.php). Daily temperatures are derived from the NOAA cooperative observer network. County-level soil characteristics were derived from the State Soil Geographic (STATSGO) climate division database. If necessary, missing county temperature and precipitation data are estimated using the MRCC daily gridded data. Average values of county soil moisture are computed by week with county data from 1972 to last year. Weekly composite of surface temperature as measured by the MODIS sensors on the NASA Terra and Aqua satellites. Streamflow data are reported to the USGS system in real time, with the map being a snapshot of streamflow amounts on a given day. The dots are streamflow amounts in the normal range; orange, dark red, and red are progressively lower than normal streamflows; and turquoise, blue, and black are progressively higher than normal streamflows. Even though streamflow can respond rapidly to heavy precipitation events, it may take many months of drought conditions to cause streamflow to fall to low levels, providing a good indicator of hydrological drought that may affect water supplies. The Palmer Crop Moisture Index is a very short term indicator of drought condition on a weekly time scale relevant to crop management during the growing season. Temperature and precipitation inputs are factors in a water balance model that determines whether soils have enough moisture to meet the short term needs of crops (positive value) or do not have enough moisture (negative value). These images illustrate the current weekly "greenness" maps for the state as derived from the NOAA AVHRR passes that have been developed by the USFS - Wildland Fire Assessment System (WFAS). The date on the image is the end date for the weekly average. The Visual Greenness image portrays vegetation greenness compared to a very green reference such as an alfalfa field or a golf course. The resulting image is similar to what you would expect to see from the air. Normally dry areas will never show as green as normally wetter areas. The Relative Greenness image portrays how green the vegetation is compared to how green it has been historically (1989-2003). Because each pixel is normalized to its own historical range, all areas (dry to wet) can appear fully green at some time during the growing season. 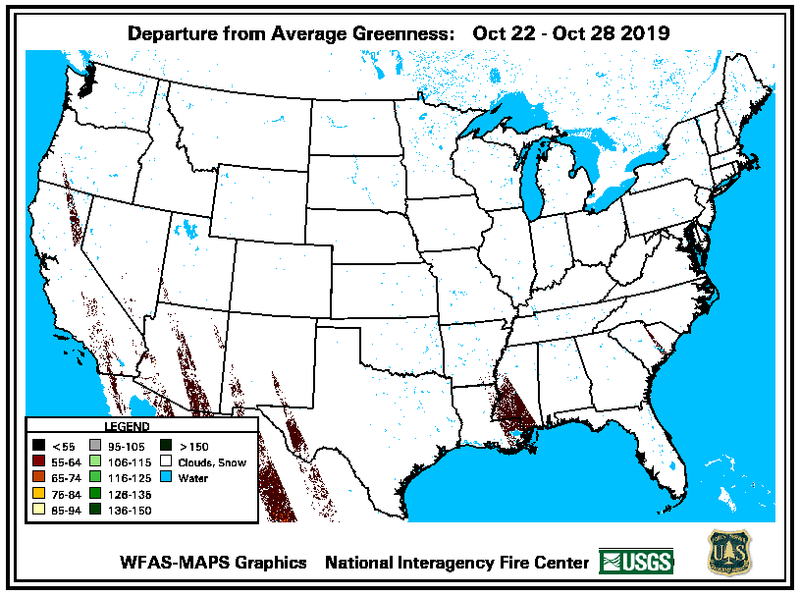 The Departure from Average Greenness image portrays how green each pixel is compared to its average greenness for the current week of the year based on 1989-2003 data. These outlooks are produced by NOAA's Climate Prediction Center, and are based on a blend of statistical and modeling forecast products and expert opinion. Statistical forecasts use observations of the sequence and size of climate variations in the past to give clues to future variations. Mathematical models of the atmosphere and oceans predict near future conditions using our fundamental knowledge of climate system processes and current conditions as a starting point, in a way quite similar to weather forecasting. In both cases, one cannot predict the weather for a single day in the distant future. Instead, climate forecasts give the chances for certain variations to occur in the next 30 or 90 days, or further into the future. The U.S. 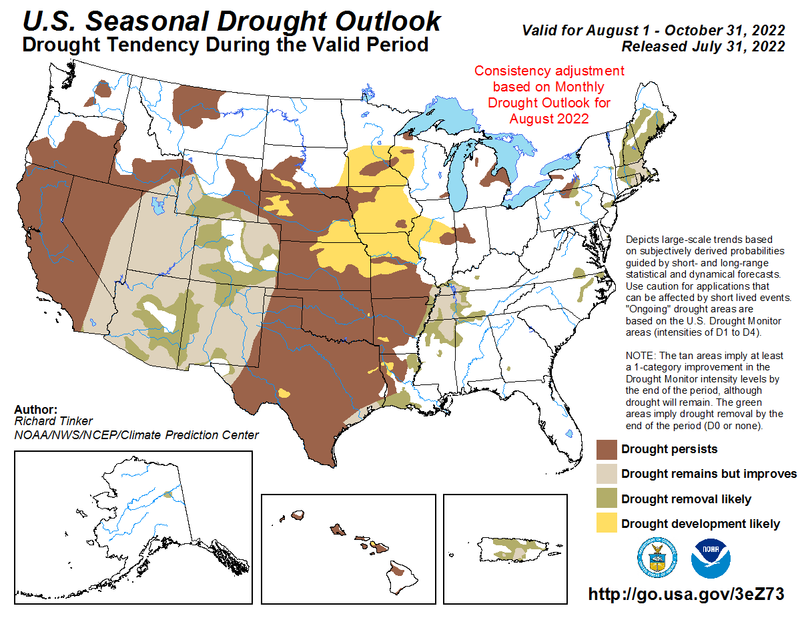 Seasonal Drought Outlook map indicates whether existing droughts are predicted by experts to stay the same or worsen (brown), improve somewhat (stripes), or improve substantially (green) during the three-month forecast period. Areas predicted to have new drought development are marked with yellow. This map is updated on the first and third Thursday of the month. The 30-day and 90-day forecasts of precipitation are given as the percentage chance of amounts being above normal (green), normal (gray), or below normal (brown) for the time of year. The overall chance for each precipitation class is 33.3%, 33.3%, and 33.3%. 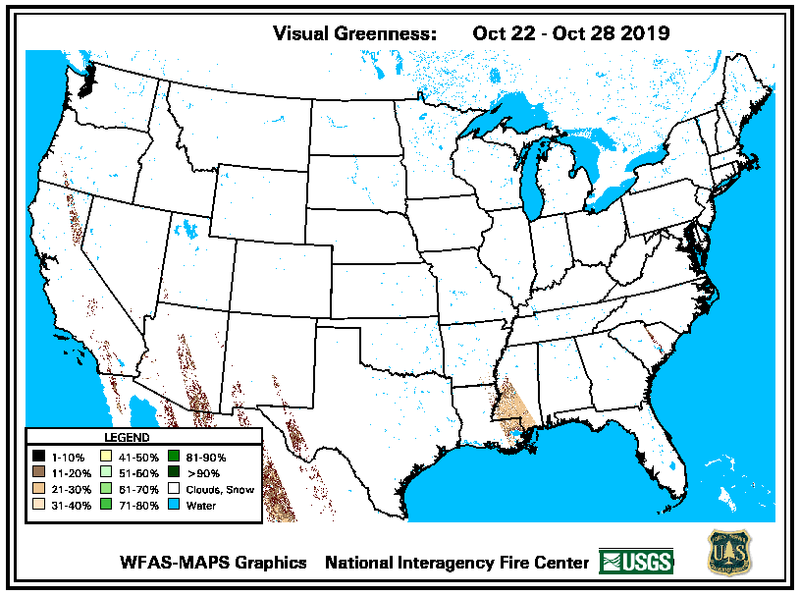 If a map shows a percentage of 50% in green, for instance, that means the chance for above normal precipitation is considerably larger than the normal 33.3% chance. Some locations are marked "EC", which means that there is an equal chance for precipitation to be above normal, normal, or below normal. Only in certain regions and during certain times of year can precipitation departures from normal be forecast skillfully. Both 30-day and 90-day precipitation forecast maps are updated on the third Thursday of the month, while the 30-day map is also be updated near the 1st of the month.